Casting Call: We’re Looking for Two Brides-to-Be! 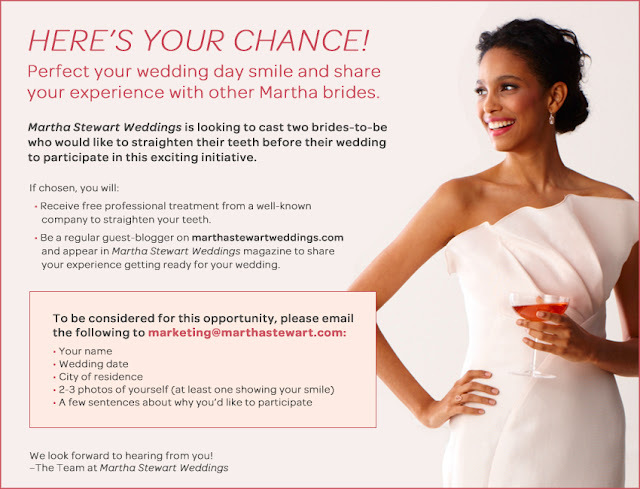 Martha Stewart Weddings is looking to cast two brides-to-be who would like to straighten their teeth before their wedding to participate in this exciting initiative. - Receive free professional treatment from a well-known company to straighten your teeth. - Be a regular guest-blogger on MSW.com and appear in Martha Stewart Weddings magazine to share your experiences getting ready for your wedding. A few sentences about why you’d like to participate.